Which is your Favorit location in the Beast's Castle? Which Bimbette is Mehr lusting for Gaston? Avenant's motive was to harm the relationship between both Prince Adam and Belle Von turning the former back into the beast! Belle will have to start from scratch Von breaking the spell, and both tried stopping Avenant along the way. Hi guys, I was inspired Von a video on Youtube to write this article, so what Du are going to read is my theory on whether oder the Enchantress is really Prince Adam's mother. In both the 1991 and 2017 versions, both his parents had died and his mother is so disappointed on her only son's behaviour as she watches him from the above. That she became the Enchantress to test him, ultimately turning him and the Verzaubert Objects! Well since I'm a Fan of both films, I will be Schreiben on how similarities both films are. Hi guys, I would like to write some of my favourite Schauspielerinnen who play Belle the best, starting from the best to the lowest. Ready? I was really happy that Howard Ashman (RIP) made the right choice Von choosing Paige to voice the 5th Disney Princess, he discovered her when she was doing the showboat the Musical back during the late 80's. I find both her speaking and Singen voice relaxing and pleasant to listen to, she has a European sounding in it and sounds like Judy Garland at some point of the film. Hi guys, since I had done the review for the 2017 film, here is my comparison for the 1991 film with the 2017 version like what I did previously with Aschenputtel & Maleficent. Despite my initial skepticism for the 2017 live-action reboot, I was very happy with a number of things, especially about both Belle and the Beast's childhood, both Lost their mothers and we also get to see their interactions Mehr than the 1991 version. Hi guys, I had gepostet a Umfrage on the Disney Princess site and here are my favourite Prince Adam's Finale Outfit, ranging from most to least favourite. I have always Liebe this version, because it Zeigen details towards his outfit, especially the jacke which we can see the blume patterns on it! I always thought it was a Spanish style due to the Design overall, but it's actually French style from the 18th century. The Quelle material and its Disneyfication compared. Courtesy of "Disneyfied, oder Disney-tried?" 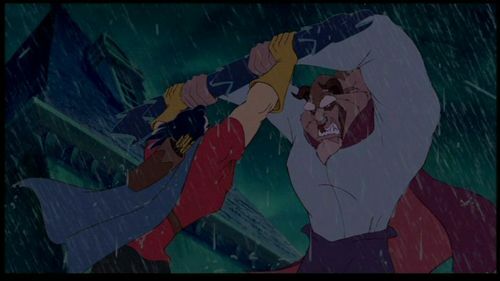 What does the Beast say to Gaston during the rooftop fight? "So you're that hunter I've heard about." "Who are you? What are Du doing here?" Watch Beauty and the Beast Tv Zeigen Online .